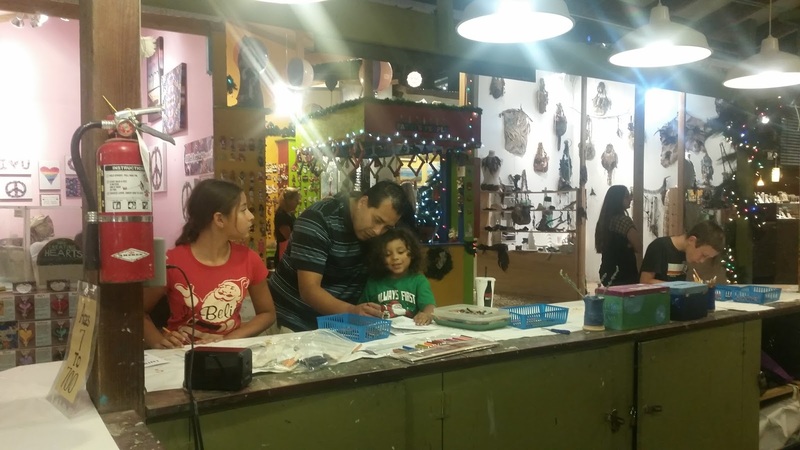 Santa, Art, Crafting, food, drinks and more, the Winter Fantasy at the +SawdustArtFestival has something for everyone! 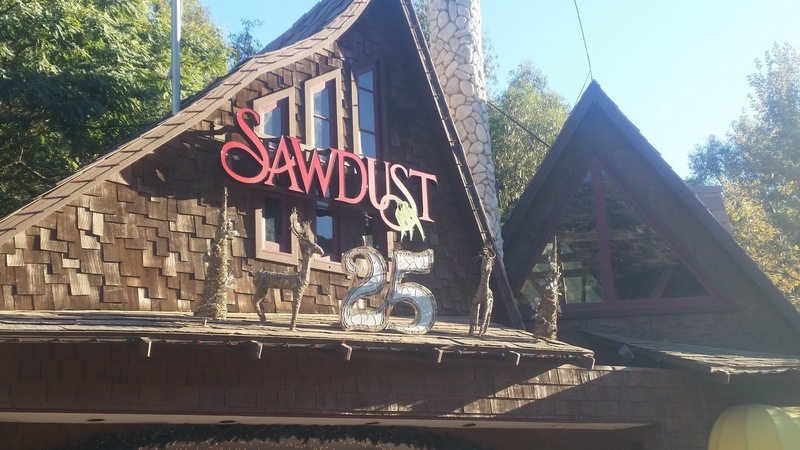 We have loved visiting the Sawdust Art Festival for years. Since I can remember my parents have taken us and now that I have kids we attend too. It is kind of tradition! 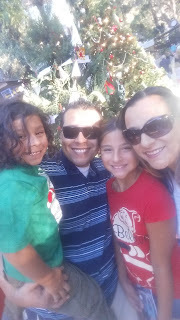 This year was the first year that we went to Winter Fantasy. The celebration of the Holidays has been going on for 25 years! There was a lot to see and do inside the festival grounds where there is always art to be seen. What can you expect to do and see? * Santa - right in the middle of the festival there is a little house and if you time it right the snow flurries start and you can see both the big man himself and some snowfall. What I loved about this Santa, he looked and played the perfect part. My son was not listening to his best and started to jingle the bells, Santa told him to shake them and let the reindeer know that he was there. It was so sweet to see. He asked my 8yo what she wanted and when she said an American Girl Doll he said that those were super special for very responsible and nice girls. LOVED HIM! This was the first year my son did NOT cry with Santa. Score. 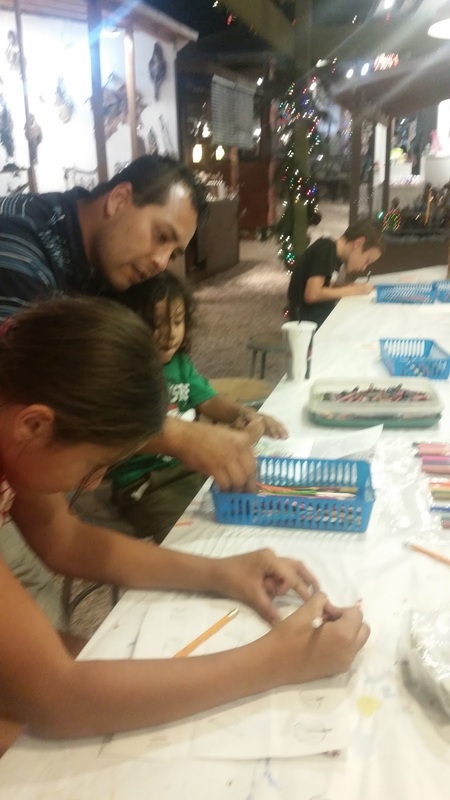 * Art - There are two awesome Art stations to craft at. The crafts change each session and are super fun for all ages to do. Most are free but the ones that did cost were a dollar or two. at most. 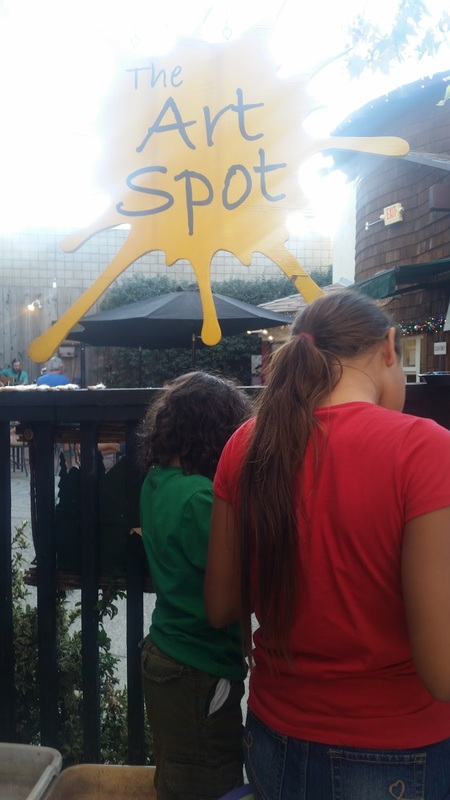 Both of the kids loved the Art spot. They made snow man and were able to take their time doing so. My son got the help he needed and was let free to create his own version of rainbow snowman. My daughter loved the sticks and acorn she used for arms and a hat. So fun! 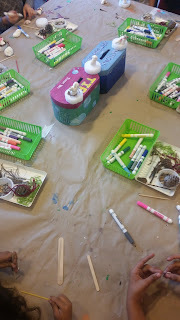 This was a very sensory friendly activity and took up about 30mins. Parent is allowed to help. 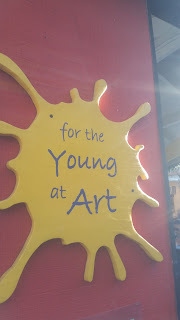 Also a second location for art that was available is also where art is done regularly with kids for art classes. 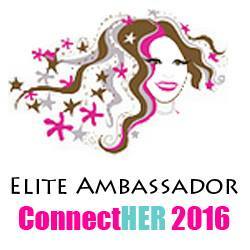 You can get all that info here! Both kids were able to do what they were comfortable doing. Zoe made a 12 piece hand drawn memory board game and Mikey was sitting coloring freely. Again, perfect for both kids and very sensory friendly. * Clay Station - On site there was clay molding. Pottery stands are there and with help, you can make a creation on the wheel. There are different costs depending if you wan to take what you make free un fired or get it fired for minimal cost. Very fun and again sensory friendly. All ages welcome. * Food and Drinks - there is plenty to snack on and plenty to drink. From BBQ to Mediterranean, wine to beer, you can fill your tummy if you want to! * Items for Sale and on Display - of course we loved looking at all the different art. 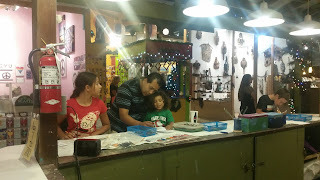 Paintings, crafts, hand made jewelry, hand made ornaments, paintings and so much more. There is plenty to see and buy this year and it is all unique and beautiful. This is where I got my first toe ring in 1997. Talk about nostalgic. 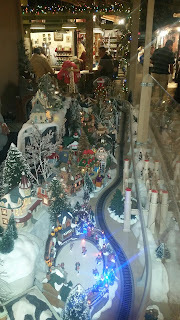 * Train Village display - check out what both of my kids and my husband could not get enough of. A super cute village where a train goes around and the WDW Monorail makes it's rounds too! So fun to see the different houses in the display too! Everything was very cute and very full of creative spirit. You can tell that everyone displaying their wonderful items does so with passion for the arts. It really is a unique experience to see and show my kids. 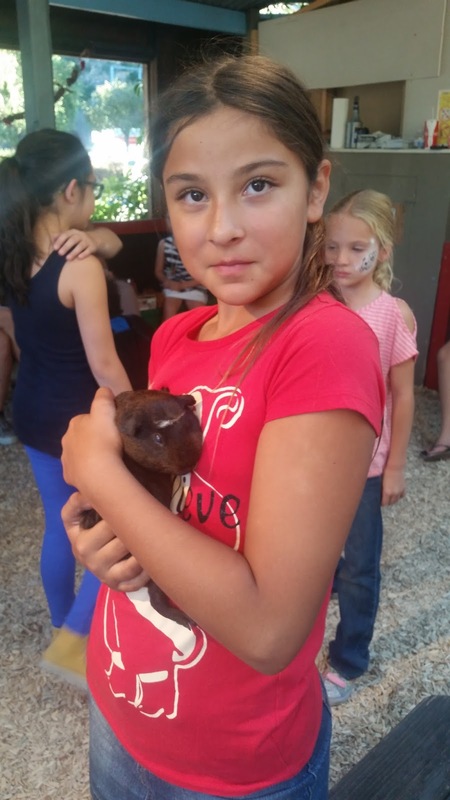 Did you know that Zoomars Petting Zoo is on hand too. This was a huge help for my daughter when her brother decided to throw a fit. She was able to go in and have some animal fun. 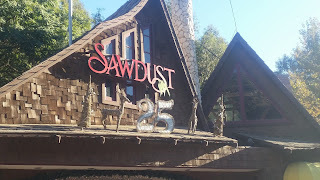 Thank you to Sawdust Art Festival for the invitation to attend and we will see you very soon! Get more information on the Winter Fantasy in it's 25th year HERE!